In December 2018, more than 20,000 participants from almost 200 countries came together to discuss climate targets over the course of two weeks in Kattowice, Poland. In December 2018, more than 20,000 participants from almost 200 countries came together to discuss climate targets over the course of two weeks. It was even necessary for the negotiations, held in the Polish city of Katowice, to be extended. Ultimately, however, decisions were made. The Katowice Rule Book primarily defines uniform reporting procedures. Although by the time the World Climate Conference began, 194 nations and the European Union had ratified the climate targets formulated in Paris in 2015. And yet, until now, however, the signatories were largely able to decide for themselves how to best calculate their greenhouse gas emissions. This is now set to change. According to the regulations agreed upon in the southern Polish city on 15 December 2018, uniform guidelines for measurement and documentation methods will apply from 2024. These are intended to facilitate mutual control and improve the comparability of the results. For example, published data may not be older than three years. Some developing countries may make use of postponed deadlines should they not have the necessary prerequisites for small-scale documentation. 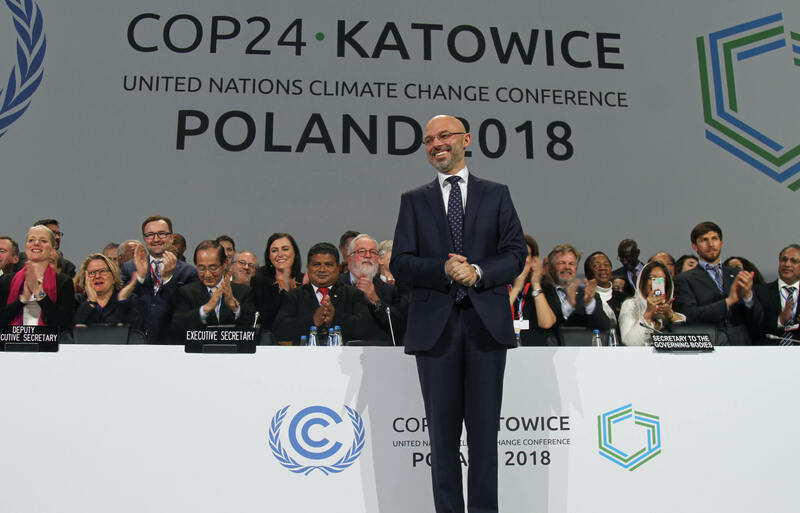 COP24 President Michal Kurtyka at the Closing Plenary Session of the UN Climate Summit in Katowice (Source: UNclimatechange Flickr, licensed under CC BY-NC-SA 2.0). The increased transparency is also intended to optimise the financing of climate targets. Measures to reduce greenhouse gas emissions in developing countries are to be co-financed by various funds. In Katowice, rules have been established according to which these climate funds will be financed in the future. In addition, the financing for these funds has been outlined to 2025 and beyond. Damage caused by climate change will also be documented moving forward. Reparation payments, however, were not stipulated. An agreement on the market mechanisms provided for in the Paris Agreement to increase cost efficiency was postponed. According to the agreement, countries could fulfil their climate commitments within the framework of international emissions trading by financing measures against greenhouse gas emissions abroad – because they are cheaper there. Conversely, countries that save more than agreed could sell these emissions. The member states were also unable to agree on penalties for violations of the Paris climate targets in Katowice. That being said: If all states adhere to the rule book, the measures and progress of the signatories towards their climate targets will become clearer. This should at least make it possible to impose sanctions through “naming and shaming”.